There’s always one annoying dude at the table screaming, “no spinning!” whenever you’re playing foosball. But when you replace the game’s handles with high-speed electric drills, frantic spinning is the only real gameplay strategy you have at your disposal. 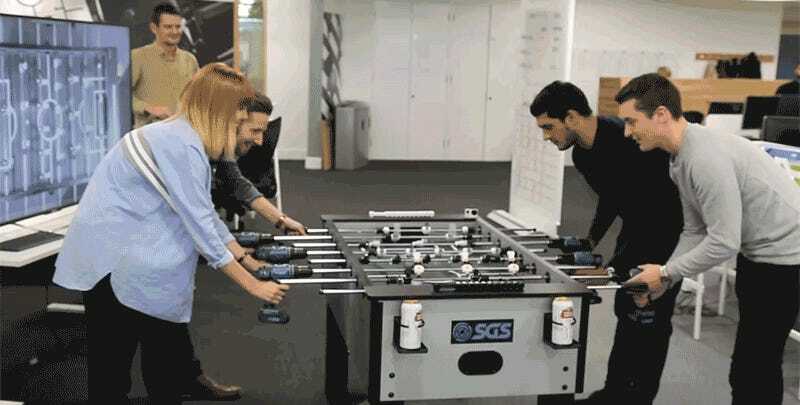 The folks at SGS Engineering in the UK upgraded their office’s foosball table with power tools in an attempt to take the game to a whole new level. But the end results have the ball blasting across the table like it’s been shot out of a cannon. There’s barely time for other players to react to a shot, let alone execute any kind of gameplay strategy. However, if you need a pick-me-up in the middle of the afternoon when you’re feeling sleepy at work, playing this version of foosball is one way to get your heart racing.